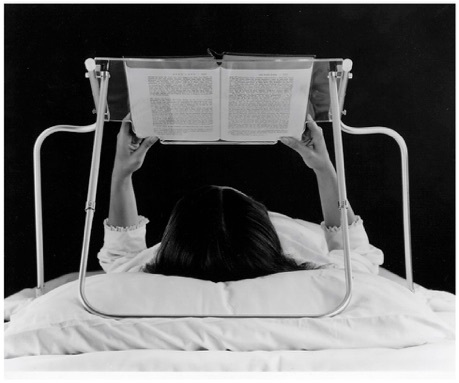 Enables a person to read in bed while Iying in a completely flat and relaxed position. Pages turn quickly and effortlessly. Large books fit just as well as smaller works and paperbacks. Height adjusts in front and back. A stationary frame holds the book in a raised position above the reader. The book rests against a clear plastic surface, face down. The reader looks through the plexiglass to view the page. Ample room is provided for shoulder, head and arm movements. The Bed Reader adjusts to accommodate varying degrees of near or farsightedness; it may be used with or without glasses, and on varying degrees of bed tilt. 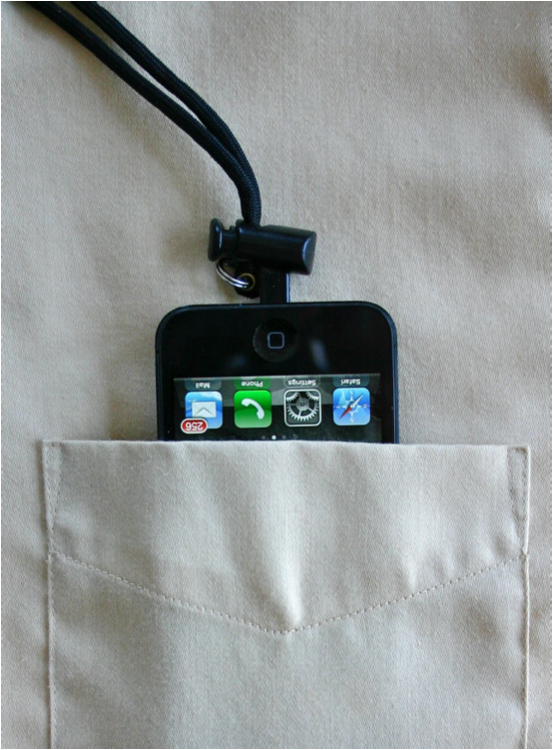 The device folds automatically when raised. Strong, lightweight material is used throughout to create a unit of exceptional sturdiness, appropriate for children as well as adults. The reader simply pushes his thumbs slightly against the bottom margins of the book, easily accessible through the lower plastic cutouts (see photos). The thumbs then rise up each side of the page, not losing contact with the edges. As the thumbs rise near the top of the book, the book is bent out and away from the plexiglass. At this point the right or left forefinger turns the page over in the customary manner. Once the page is turned, the book is replaced in its original position, Iying face down on the plexiglass. Adjust the device by pressing the snap button on each side and sliding the telescoping rear "U" shaped member to the desired length. Make sure you slide each snap button into the desired hole in the larger 5/8" Diameter tube. Adjust both sides simultaneously to provide even travel of the rear frame. Adjust front legs similarly. 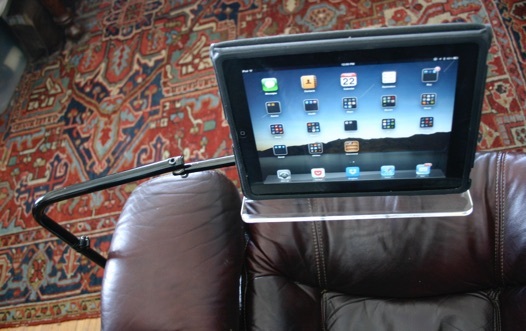 Normally the rear frame is placed so that it rests on the pillow, just behind one's head. When the device is properly adjusted, a person's relaxed line of sight should fall on the center of the page. 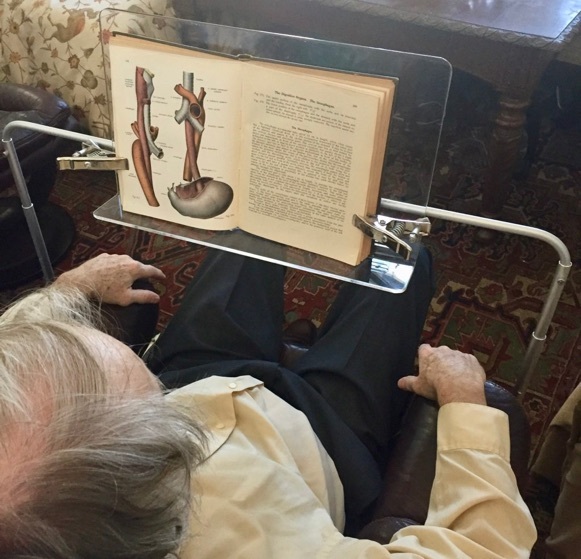 The Bed Reader folds automatically when the device is raised. 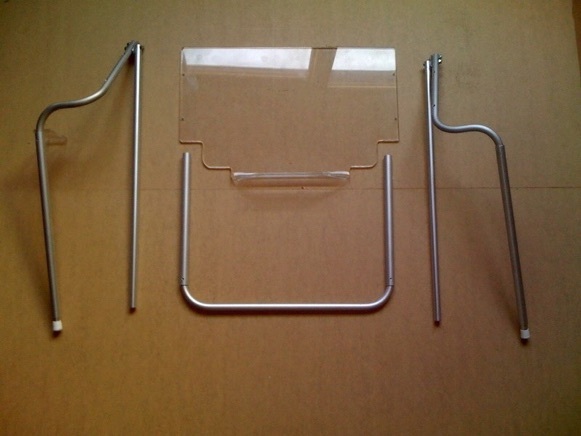 Hold the Bed Reader on the portions of the frame at the side of the plexiglass and raise the device. Once folded, the Bed Reader can easily be laid against the side of the bed, readily accessible for your next use. Always clean the Bed Reader with a soft cloth or tissue and soap and water. With proper care your Portable Bed Reader will last for many years. The size of the lectern is 17” wide and 10 1/2” high. Plexiglass is 1/4” thick with edges hand flame polished. The weight of the unit is approximately 4 3/4 pounds. The “U” shaped back telescopes out from 19” to 25”. The front legs telescope below the lectern from 15” to 21”. The front and back legs fold in for additional adjustability and storage. Tubing is 1/2” and 5/8” OD aluminum tubing with an anodized finish. Solid rod components are 1/2” D aluminum, also with an anodized finish. Arrange parts as shown in picture. 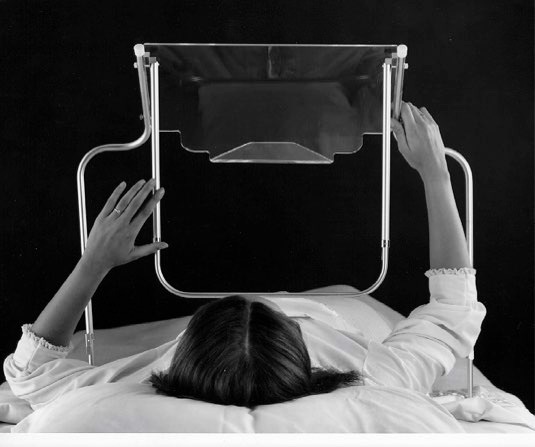 Over the years there have been slight changes in the design of the Portable Bed Reader. The accompanying pictures at the top of this page show how the front legs line up with the lectern and how to use the unit. However, the white caps are now on the bottom of the front legs, rather than on the top. Also, we now use snap buttons to telescope leg length, rather than latches. 1. Line up each leg assembly in turn under the plexiglass lectern. Line up just one leg onto the plexiglass at a time. The bottom shelf of the plexiglass lectern must be facing up, and towards you (see picture just above). The aluminum legs go underneath the plexiglass (on the back side, opposite the shelf) and bend out (sideways) from each side of the plexiglass. The shorter part of each leg lines up with a side of the plexiglass. The bottom end of each leg has a white cap on it and should be down, in the same direction as the shelf. The bottom of each leg should also bend behind the plexiglass, away from the shelf. Make sure the two nuts on the top of each front leg are at the top of the plexiglass (opposite the shelf), and face out. If you do this you will make sure the legs are lined up correctly. Check these directions before going to step two. Remember, just line up one leg at a time. 2. Bolt each leg to the plexiglass lectern, one at a time, using two bolts and two knurled nuts for each leg. Each bolt goes first through the front of the plexiglass and then through the leg; the nut is fastened onto the back of the aluminum leg. 3. Insert the U-shaped tube into the swinging rear arms attached to the front legs, making sure the holes for the snap buttons are on the same side as the snap buttons on the swinging legs. Insert both sides of the U-shaped tube simultaneously by inserting the U-shaped tube a little bit into one swinging rear arm, then repeating this action on the other swinging arm. After the U-shaped adjusting element is inserted a couple of inches into each swinging rear arm, it will easily slide in and out. 4. Adjust the front and rear telescoping tubes for the desired length, using the snap buttons and holes. Latches are no longer used. If you find the snap buttons are hard to press, press the shaft of a pen or pencil against the button, placing your thumb on the opposite side of the shaft from the button. With Adjustable Height: 25-40”, Adjustable Width, Adjustable Tilt, and Adjustable Distance from Eyes.